Ah football season! I hate you because we live in the Central Time Zone which means every game is on past my son's bedtime and every game he is asking me to stay up late. But I do love you because football season gives me half a dozen opportunities and twice that many reasons to eat appetizers. Like buffalo chicken dip and mini hot ham and cheese sandwiches. I love appetizers. 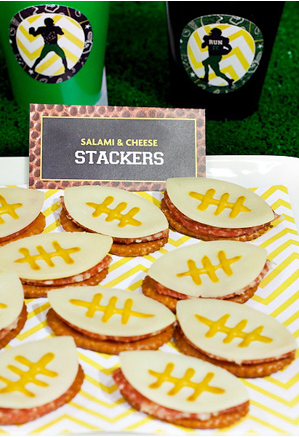 Jennifer has some fun ideas for throwing a football bash over on her blog right now. It includes some fun appetizers like these salami and cheese stackers. And some fun free football party printables. 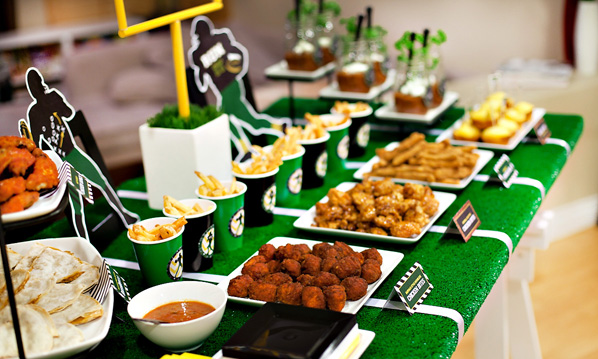 And it is all served up on a gridiron table. The perfect backdrop for all this football party fun. You can see more of her cute football party ideas over at Hostess with the Mostess.